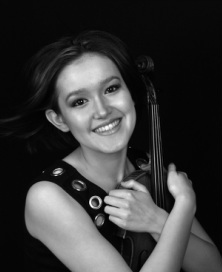 Sixteen-year-old violinist Marié Rossano has appeared numerous times on the concert stage. She has appeared as soloist with the Seattle Symphony, Bellevue Philharmonic, Ottawa Chamber Symphony, and the Bainbridge, Coeur d'Alene, Federal Way, and Sammamish Symphony Orchestras. In addition to the traditional concert hall setting, Marié performed with the Seattle Symphony at their December 2007 Holiday Musical Salute benefit concert, and with the Bellevue Philharmonic at the 2008 Symetra Bellevue Family July 4th event at Bellevue Downtown Park. Next season, Marié will perform the Bruch G minor Concerto with the Bremerton Symphony and the Shostakovich A minor Concerto with the Seattle Philharmonic as the winner of their 2010 Don Bushell Concerto Competition. Marié performed at the Juilliard School's 2009 Starling-DeLay Violin Symposium, as one of nine Young Artists selected from around the world; she was also opening guest performer at Seattle University's 2008 "Future of Classical Music" Summit and at the 2009 Seattle "Bach to Byte" Conference. Other professional engagements include recitals for the Seattle Chamber Music Society (2007), Music of Remembrance (2008), Bellevue Philharmonic (2008), and Methow Valley Chamber Music Festival (2009). She returns to Methow Valley this summer for their 2010 Festival. In March 2009, Marié played on Stradivari and Guarneri violins from the Fulton Collection, as the featured artist for a KCTS 9 TV Salon Series concert, and in a documentary showcasing the Collection. Upon making her Seattle Symphony debut in October 2007, Marié was featured in the Seattle Times and appeared in Teen Strings Magazine; she also appeared on KOMO 4 TV's "Northwest Afternoon". In March 2010, she was broadcast live on 91.1 KPBX FM Spokane, as guest soloist with the Coeur d'Alene Symphony and winner of their 2010 National Young Artists Concerto Competition. Named the National Winner of Music Teachers National Association's 2008 Junior Strings Competition, Marié has also won the American String Teachers Association's 2009 Washington State Junior Solo Competition, Seattle Music Teachers Association's Simon-Fiset Strings Competition thrice, as well as numerous concerto competitions including the Seattle Young Artists Music Festival's 2005 and 2007 competitions, also winning SYAMF's prestigious Festival Medal. Among Marié's other notable awards are the Academy of Music Northwest's 2007 and 2008 Marc Erlitz and Charles R. Wolfe Violin Performance Awards and Music of Remembrance's 2008 David Tonkonogui Memorial Award. Marié receives private instruction from Simon James, Brian Lewis, and piano collaborator Hiro David, having previously studied with the late teachers Yuko Honda and Kent Coleman. Marié attended the 2008 and 2009 Brian Lewis Young Artist Program, where she also studied with Stephanie Chase, Stephen Clapp, pianist Pamela Pyle, among others. Marié has participated in master classes given by James Ehnes, Paul Kantor, Leonidas Kavakos, David Kim, Sherry Kloss, Vadim Repin, Kurt Sassmannshaus, Jan Sloman, Joel Smirnoff, and Kyoko Takezawa. A recipient of the Academy of Music Northwest's 2008 Chamber Music Award, Marié is also an avid chamber musician. She is founder and leader of ORCAstra, a student-run, conductorless string ensemble based in Seattle. She is also concertmaster and frequent soloist with the Academy Chamber Orchestra and Eastside Project Chamber Orchestra. Marié performs on a Nicolò Gagliano violin made in Naples in 1733.